General Motors gave thanks this holiday week to the millions of taxpayers who helped bail them out last year. The timing of the ad is at least better than Chrysler's failed attempt at thanks in 2009 when they thanked people using a full page advertisement in the Wall Street Journal and USA Today right after they received the bailout money. At least, GM had the sense to wait for a thank you the week after they went public with their IPO and return to investor financing. I see two desired outcomes GM wants from this particular ad. One to energize people who like the brand. Second is to get people to see GM has a fighter that didn't just lay-down after it got its money. They want people who have lost faith in GM to know the brand is getting up, not giving up and wants to be seen as a survivor and champion. The imagery used in the ad is all about not giving up. It shows several historical and socially recognizable clips when it looked over, but the people in the ad did not give up and found the strength to win. The biggest criticism I can see from the imagery used is that all if it showcases individuals who got back up using their own freewill and not through a helping hand. No one gave the boxer a 5-hour energy drink, shoulder massage and pep talk to rise up from the mat. Sure someone helped Evel Knievel up from his accident but he got back on the bike himself and kept going. The Henry S. Truman image makes no sense. That was just the Chicago Tribune showing how low their opinion was of Truman. There was no falling down, just miscalculation. Perhaps Popeye is the most relevant image as he gets his boost from an outside source - spinach. 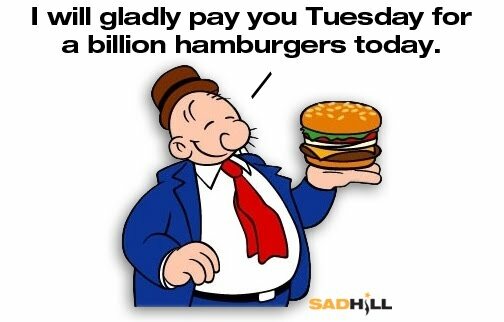 But unlike Wimpy, Popeye probably didn't have to borrow the money today with the promise of paying it back Tuesday. Cynics might think Wimpy was the better image to use..? It would be interesting to see how they tested this ad. Did GM bring in people upset with the bailout or did they focus test against people open to seeing GM as independent again. My guess is more the latter. Perhaps it has a chance of getting people 'on the fence' to see GM as a fighter and survivor. Personally, I think they are fighting the good fight. GM has not laid down and they are trying hard to win back public opinion. Unfortunately, this ad falls down in its ability to recycle history as a way to repair GM's image. Fortunately, their new products are giving them a true fighting chance. Yea, not sure if this hit the mark. Would have been better to get some energy like using Chumbawamba's "I get knocked down, but I get up again, you're never gonna keep me down..."And though the song's about intoxication, there's something oddly "right" and maybe even poignant if it were done in a way to not Drink and Drive. And maybe then it'd give the Harry S. Truman image some context. But then again, maybe not. But at that point - who'd care. Audience recall would be, "Hey! Cool song. From GM, no less. Now, what was its point? Ahh, never mind. Cool song..."
Oh man there is so much I have to take umbrage at with this spot. I agree with everything you said Chris. The reason they are profitable is from the restructuring forced by the government which included shutting down dealers, divisions, getting out of the union healthcare, and the monetary support. They might be a public company again but they are not out of the woods. They still have more ugly cars than good looking ones. And that is an issue. I understand how you can see a false equivalency between GM and the images it chose, but I disagree with the premise of your argument. I don't see the spot as attempting to energize people or show GM as a survivor and champion. Vehicle sales and the IPO have done that. IMHO, GM wanted to express their gratitude for the helping hand that allowed them to get back up, and they didn't want to come across like the Wall Street Robber Barons who have accepted every dollar they have been handed without helping main street. Personally, on our national day of giving thanks, I was reminded that America is at its best when it gets back up. And that a helping hand can go a long way. After watching the commercial I had the same feel, all those depicted there got up on their own, not with government money taken from taxpayers. Another difference is that they recognized the fall and got up right after that, GM was down for as long as...40 years and never recognized that until the day they filed for bankruptcy. I agree with you, Chris, Truman image makes no sense, somebody there needs a more profound history study. The only way for GM to be thankful is to pay back their loans. And that's where the problem is: even if GM pays the loans in full, GM just got away with paying some taxes, in the order of around $20b from what I remember, in the next 20 years. And that is not what I would call "fighting the good fight". No matter how we turn it, GM will leave a hole in taxpayers' pocket to the amount of tens of billions. But my emphasis on GM model is almost positive. I like the different products of GM and I've finalized to buy one mini truck of General Motors for my small business. By the way, here is a lucrative post by you.